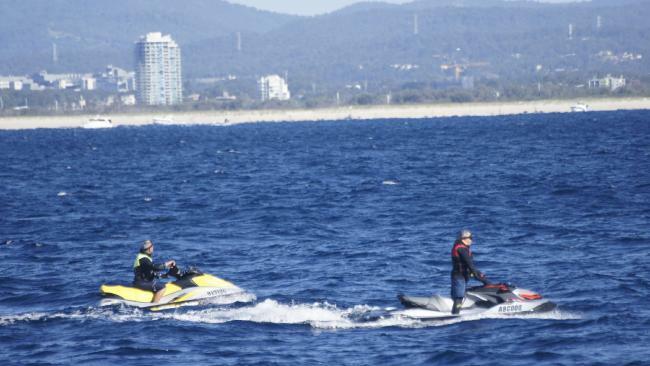 Jet skis come close to humpback whales off the Gold Coast. Pic: Whales in Paradise. 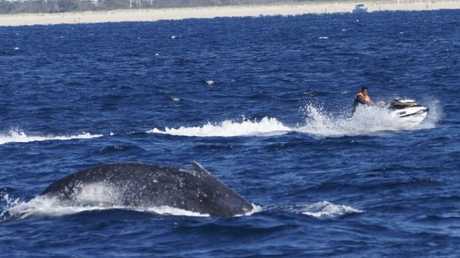 CALLOUS jetskiers have been urged to be wary of vulnerable baby humpback whales as the marine giants begin to calve in Queensland waters. 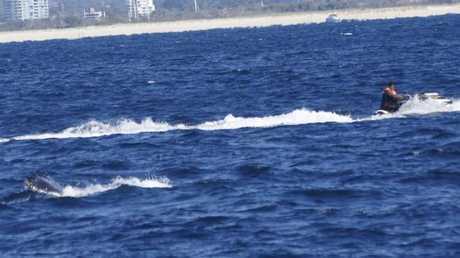 Whale watching operators and conservationists have recently captured photos of jetskiers motoring nearby past the marine giants just off the Gold Coast. They have renewed calls for vessel operators to "go slow if they see a blow" because the engines can disorientate the humpbacks. 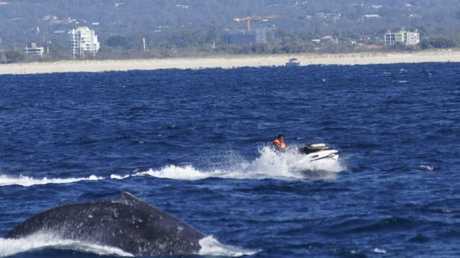 Jet-skiers and boat users risk a $630 on-the-spot fine for getting too close, and a maximum penalty of $20,814 for special interest whales such as Migaloo the famed white whale, the Department of Environment and Heritage Protection warned last year. About 33,000 are expected this migration season. Whales in Paradise marine educator Laura Torre-Williams said jet-powered vessels could harm baby whales which appear in the Gold Coast bay between Point Danger and South Stradbroke Island. They arrive between July and August and travel south past the city in September and October. "If a baby is separated from its mother, it's done," Ms Torre-Williams said. The sound created by jetskis often cause whales to dive to deeper water, and some calves can struggle to keep up with their mothers," she said. Whales in Paradise crew member Toby Sulis urged jetskiers to keep the required 300 metres from whales or dolphins and boats at least 100m from the creatures. The are both requirements by the Queensland Government. "I am not sure the jet ski operators understand that there are rules they have to follow,"
"They need to give the whales some space." It comes after a whale was spotted travelling north off the Gold Coast with a large gash in its back caused by a boat last month. Researcher Dr Olaf Meynecke, of Humpbacks and High-Rises, said the injury could eventually kill the animal. "However, spinal damage to the whale is likely and warm waters can result in infection of the wound and consequently death," Dr Meynecke said at the time.